Scraping the Ribs: A rectangular cabinet scraper, sharpened with a 45-degree edge to knife-like sharpness, is used to scrape one side of the ribs smooth. The edge of the scraper has been turned very gently to make a tiny hook along the whole edge that does the cutting. 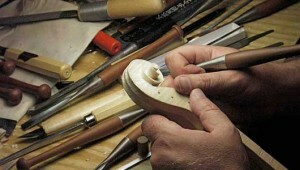 Marking Rib Thickness: This tool is a copy of Stradivari's own, which I saw in a museum in Cremona. It's primarily for marking the graduations of tops and backs, but also works well for other jobs, like this one. By turning the nut under the rib, the distance between the nut head and the point/scratcher is adjusted to the thickness required for whatever is being worked on. Close-up of Depth Marks: The scratches the marking tool leaves are quite deep. I need to plane and scrape the wood until the scratches are gone. Then the thickness will be correct: just over 1.1mm at this point in the process. Planing Rib Thickness: The ribs are planed until just a trace of the scratches are left. Toothed Plane Blade: The teeth in the blade prevent the curls of the wood from tearing out. Scratches from the Toothed Blade: Sometimes the makers of 300 years ago didn't scrape out all their marks, and you can see tooth marks in the wood--especially inside the instrument. The Ribs, Scraped Smooth: The ribs are scraped smooth and to thickness. A sharp scraper makes only shavings--not dust! Planing the Rib Heights: I clamp the ribs together and plane the edges all at once, so they're all the same. First one edge is flattened, then the bundle is flipped over and planed to the final rib height. Ribs Ready to Bend: It's important to lay out the ribs so that the figure is going in the right direction all around the violin. Different makers did this differently. Matching Ribs to Blocks: With the appropriate block's location marked on each end of the ribs, there aren't any mistakes or surprises! Bending the C-Bouts: A thin metal strap pushes the rib securely against the bending iron, preventing bumps and cracks. The iron is quite hot, and just a bit of dampness on the wood helps the heat carry through it quickly. Bent Ribs: The ribs are bent and ready to glue to the blocks. Precise bending isn't necessary, but the ribs should press themselves tightly against the mold when they're clamped to the blocks, so slightly underbending is better than overbending. Rib Clamping Blocks: Pictured is a selection of potential clamping blocks for holding the ribs against the blocks. If the old ones don't fit perfectly, I just throw them in a box after making new ones; in time, something that fits can always be found in the mess somewhere. Gluing C-Bouts: Pushing the rib into the c-bout presses it firmly against the form, ensuring that the right shape is established. Mitering the Corner Joint: The c-bout ribs are mitered to a feathered end. The ribs from the upper and lower bouts pass over this joint, so all that's seen from the outside is the flat ends of the ribs of the upper and lower bouts. Gluing on Outer Bouts: Finally the last ribs are glued around the form. Making Spruce Linings: Spruce linings are slit out from a larger strip with a knife and straightedge. These linings are cut from bad guitar tops that were used as packing material in one of my wood orders! They were already cut carefully to almost what I needed, and they were free. Soaking Linings for Bending: Unlike the ribs, the linings bend easiest if they're completely wet all the way through. Bent Linings: The linings have been bent just as the ribs were, on a hot bending iron, and are ready to glue in place. Fitting Linings at Corners: For strength, the c-bout linings are set into the corner blocks. Gluing Linings in Place: All of the linings are glued inside the ribs at the same time, using clothespins as clamps. Final Rib Smoothing: After the linings are glued in, the outside of the ribset can be quite bumpy, and may need to be rescraped. This is the final scraping before body assembly. Leveling the Ribs: The last thing done to the ribset is to plane the surfaces where the top and back will be glued, Leveling the linings to rib level and truing the gluing surface.